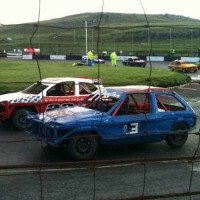 Drive real 1300cc saloon stock cars, racing on a real racetrack! Up 32 drivers in a session take to the track in groups of 8. After two 8 lap heats, take your in an electrifying Championship Final. Race Format - What's Included? Drive real 1300cc saloon stock cars. Real racing on a real racetrack! This event lasts approx four hours. Up 32 drivers in a session (mixed groups), and you will take to the track in groups of 8. Then two 8 lap heats. The points from the heats will be used to decide on your place in the Championship Final (10 laps) - an electrifying race that will pit you against drivers of a similar ability. Time permitting, and at the discretion of the Steward, the winners of the four Feature Finals, will line up for the Showdown Shoot Out Race (8 laps) to find the overall winner of the event! Available for 1-32 people, but can accommodate larger groups if required. All competitors receive a souvenir programme with their name in it. Event winners receive trophies and all competitors receive a certificate! The arrival time for this event is between 9am and 9.30am. Catering & refreshments are included and available throughout the experience (tea, coffee, hot chocolate). Snacks are available to purchase. No experience is required although the ability to drive a car is vital. Participants MUST have a driving licence. Events usually take place on Saturdays or Sundays. This activity is generally not weather dependent, but in the case of snow or ice the event may be postponed - in which case clients will be offered a range of alternative dates. Wear warm clothing as required and "sensible" shoes or trainers. Bring waterproofs in case of bad weather. All protective race clothing is supplied to you on the day. Drivers must be reasonably fit and over 17 years old. Maximum height is 6ft 5" and minimum is 4ft 11". Max weight is 20 stone.